Maruti Suzuki Swift is extremely popular in India and being a global car is on sale in many other countries. Oliver Amon has done a few stunting videos with the all-new Swift in the past. In a new video, he can be seen racing a Swift on a dirt track against motocross motorcycles and even an ATV. 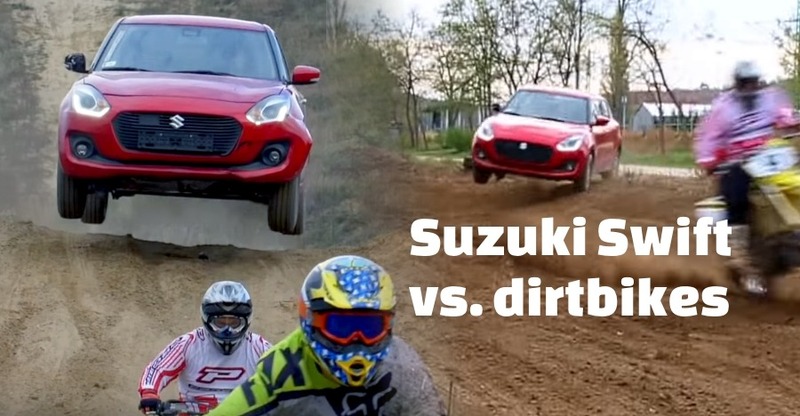 The Maruti Suzuki Swift is not a rally car but one may use it on the dirt track after a few modifications to ensure that it suffers minimal damage. The hatchback seen in the video is in its stock form. The video shows the Swift entering the dirt track from the side and driving alongside the dirt bikes and the ATV. The Swift can be seen driving aggressively on the track. The rough terrain takes a toll on the hatchback and it can be seen that the under body protection of the Swift gives away only after a few seconds inside the track. The driver, however, does not stop and keeps on his aggressive stance. He also jumps and slides on the track. The front bumper has visibly taken a lot of damage and the internal components could have been damaged too. The video is from Hungary and the Swift available there is quite different from the Indian version. It is not known which version of the Swift has been used in the video. There Maruti Suzuki Swift in Hungary gets two engine options – 1.2-litre DualJet and a 1.0-litre Boosterjet. Both of the engine options are petrol and there is no diesel engine option in the Hungarian market. The DualJet version produces a maximum of 88.5 Bhp while the 1.0-litre turbocharged petrol engine produces a maximum of 110 Bhp and 170 Nm. Suzuki also offers AllGrip AWD option in the Hungary market with the Swift. The weather conditions make the roads icy in the country, which is why the AWD system is offered on even small hatchbacks. The Hungarian Swift is quite loaded when it comes to features. Apart from the 6 airbags, the Hungarian version also gets the Electronic Stability Program (ESP), which are not available in the Indian market. With ESP, it becomes extremely difficult to make the vehicle slide intentionally and it is not switchable. Oliver disabled the ESP by removing the fuse, that disabled the whole system. Taking such small powerful hatchbacks to the dirt tracks can be fun but not before making a few changes. Removing the front and rear bumpers can make the vehicle a lot of dirt road-friendly. If you are looking to do it regularly, more upgrades can be done. Many people modify their cars with specialised tyres, suspension and aftermarket bumpers to enjoy off-road experiences on such small hatchbacks. The lightweight of such hatchbacks makes them change directions easily, which adds extra fun to it while driving on the dirt roads.